APASSION is a small privately owned ski company located in the picturesque village of Samoens in the French Alps offering two luxury chalets and one chic alpine apartment. Each of the chalets has five ensuite bedrooms, large open plan living/dining areas with log fire and incredible views, a second lounge for the kids, and outdoor hot tub. The apartment has two bedrooms, two bathrooms, an open plan living/dining area and a fully equipped kitchen. With two elegant chalets, Chalet APASSION and Chalet ALLURE, and one chic apartment, APASSION has set the standard for luxurious yet relaxing accommodation in Samoens. All the properties have been individually designed and built to provide accommodation at the highest level and have been stylishly furnished and equipped with all the essentials you would expect to find in a luxury chalet. The bedrooms are beautiful styled and are furnished with sumptuous goose feather duvets and pillows, Egyptian cotton bed-linen, dressing gowns and slippers. The bathrooms are equally as luxurious with powerful showers, White Company toiletries, thick fluffy towels and hairdryers. The large open-plan living/dining areas are the perfect place to relax after a day on the mountain and offer stunning views of the Giffre Valley and Les Dents Blanches mountain range. Each property is equipped with TV and DVD player and offers a selection of DVDs, books and games. 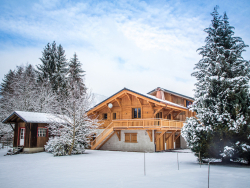 Stunning alpine, open-plan chalet set in the beautiful village of Samoens. Chalet sleeps 11 in five en-suite bedrooms. APASSION is owned and managed by husband and wife team Rob and Vicky. The Company name is synonymous with the approach that they wanted to take when establishing APASSION. The focus is on combining a passion for fine cuisine with a passion for providing a bespoke guest experience. They pride themselves on their quality of service, high standards, attention to detail and culinary expertise. All of the above set in luxurious yet comfortable and welcoming surroundings. They look forward to sharing their APASSION with you and making your holiday a truly memorable experience.